After Granville Island Pretty Sis and I went back to Yaletown for some food. 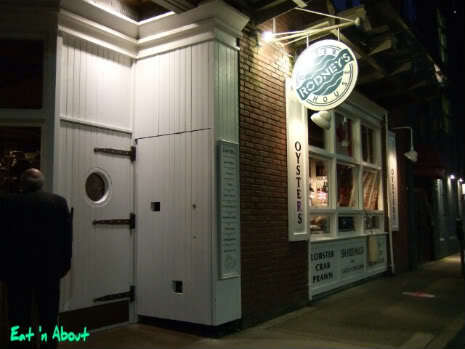 As we weren’t very hungry anymore and it was not yet 6pm, we hurried to Rodney’s for some Lowtide $1.50 oysters. They offer a variety of items from 3-6pm for a lower price. We were here specifically for the oysters but the $10 steamers intrigued me for a next visit. The Pan Fried Oysters were supposedly a good choice too. I’m definitely coming back. 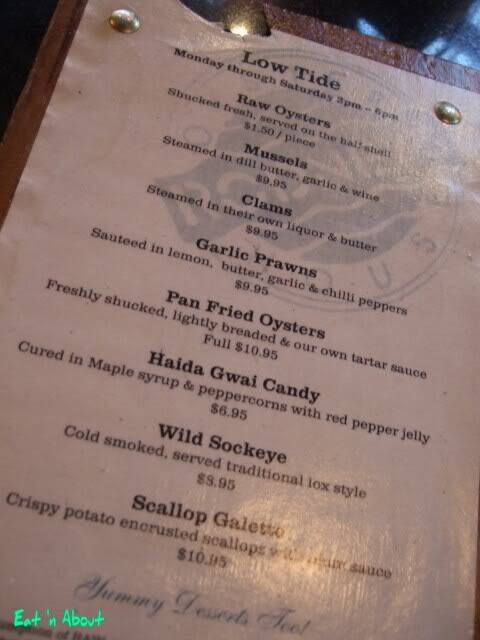 In the end I added the Haida Gwai Candy to our order since I was intrigued by the “maple syrup” (must be the Olympic fever). 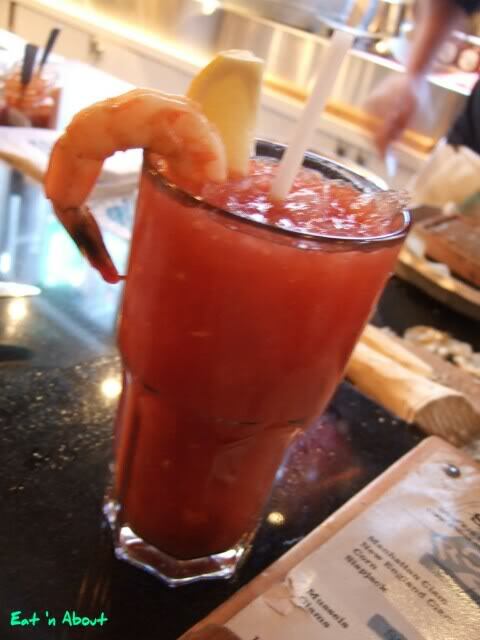 Pretty Sis kept telling me how Rodney’s Caesar ($11) is the best in the city. I think that meant she really wanted to order it, so I suggested we share one. It was indeed very nice. Perfect blend of spiciness and saltiness. I think the fresh horseradish did the trick. The Haida Gwai Candy. It was a small serving and it was just like smoked salmon. The Pepper jelly was sweet and overall this was interesting but not something i would order again. I wished they had cooked the kale underneath though because I LOVE kale! Finally the oysters. They were fresh as they should be and you don’t get a choice obviously of what oysters you get. They did sneak in one small kumamoto in there though, making it 12.5 oysters! I only enjoyed the normal cocktail sauce. The onion vinagrette tasted weird on the oysters. Fresh lemon juice gave the oysters a crispness. I was amazed at the speed they shuck, without gloves. But I guess that’s a prerequisite for working here huh. People are right in saying the staff there loves the ladies, as they kept making conversation with Pretty Sis and I, as we were seated at the bar. At one point I was just checking pictures on my camera and the oyster shucking man made me take a picture of him and asked me to post it on Facebook, labeling him “Single and Looking” haha. Even some tourists who were seated next to us joined in our conversations. I’m sure this would not have happened though if Boyfriend was here with me. Like I said, I would definitely come back to try the other Lowtide options.